The Hawai‘i Historic Places Review Board consists of ten professional experts in the fields of architecture, archaeology, sociology, history, and Hawaiian Culture. Hawai‘i Historic Places Review Board meetings are held quarterly and are open to the public. Board members are nominated by the Governor and serve four-year terms. 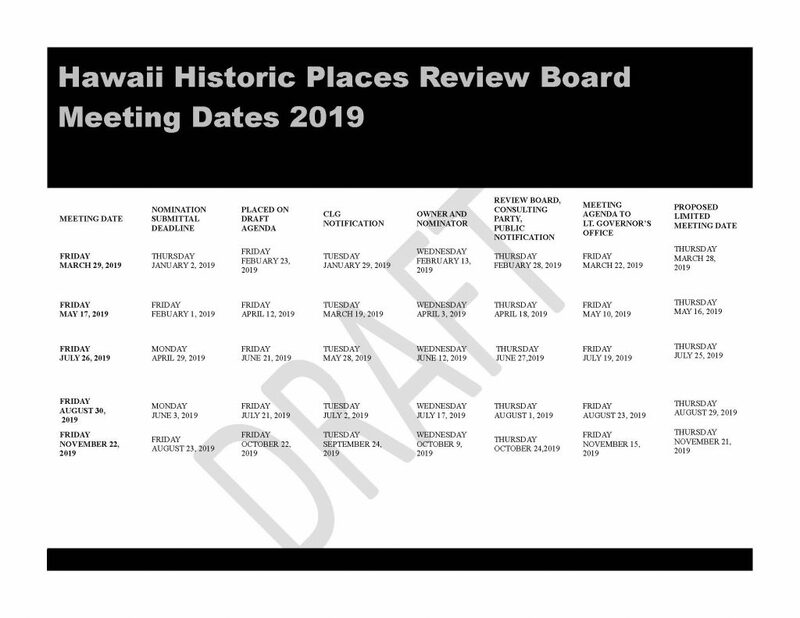 The Review Board votes on the listing of the nominated properties to the Hawai‘i Register and recommends nominations for the National Register of Historic Places. Click here or more information about the Register Program and how to submit a nomination for Review Board consideration. Review Board Counsel is provided by the Office of the State Attorney General. Click here to access and review the Review Board Documents including Meeting Minutes, Agendas, Nominations, Public Comments, and other relevant documentation.